Rosemary provides a variety of benefits, including stimulating the immune system, improving digestion, and enhancing circulation, as well as containing anti-inflammatory compounds that are beneficial for those who suffer from inflammatory conditions such as asthma and arthritis. Research suggests that rosemary may also improve concentration by increasing blood flow to the brain. With plenty of polyphenols, rosemary offers antioxidant and antimicrobial benefits, and this potent herb is also a source of dietary fiber, iron, and calcium. 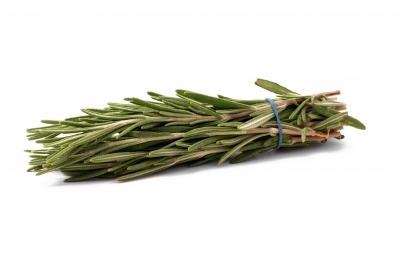 Rosemary is delicious on meats, potatoes, and roasted vegetables, as well as in omelettes and other egg dishes, soups, breads (both fluffy white and rustic whole wheat), muffins, biscuits, and tomato sauces. The fresh leaves can also be pureed in olive oil to create a bread-dipping sauce. Rosemary is easy to grow either in a yard or a container, requiring little care and maintenance. It’s not fussy about soil, watering frequency, and fertilizer (in fact, rosemary plants thrive on a bit of neglect and are happiest when their soils dry out a bit). They also aren’t fussy about container size, so it’s a good food plant even for those who lack space or don’t have a talent for gardening. Left to do its thing in a sunny spot, a rosemary plant will provide fresh leaves year-round for cooking (growth slows but does not stop in the winter) and as an added bonus, it acts as a natural pest repellant in the garden when situated near more vulnerable plants.